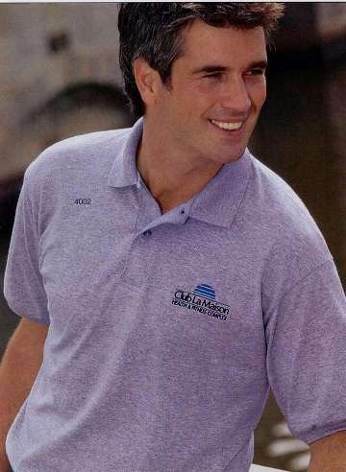 Personalized Golf -Polo Shirts in Bulk, Custom Embroidered or Printed. Promotional, Inexpensive. Budget Prices in USA and Canada. White or Colored. Top quality Custom embroidered or printed golf (polo) shirts on sale: prices reduced by 30% from our regular prices. Budget Prices for USA, Canada for customized polo shirts. American clients pay no taxes. Free artwork design. We will send you a proof for your approval before production. Unit Prices in the top row of prices below, include the T-Shirt and your 1 Color Custom Imprint in one location. Setups and Screens are FREE. Add the amount shown in the second row of prices for each additional imprint color. Add $3.00 for each size above X-Large. Embroidery prices include up to 10,000 stitches of embroidery in 1 location. The embroidery tape is free! - Welt collar and rib cuffs.